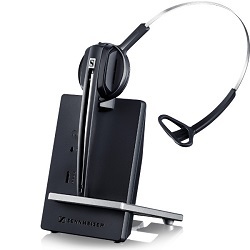 Sennheiser D 10 USB Mono Wireless Headset with Noise-Cancelling Microphone | Avcomm Solutions, Inc.
Made for office professionals working in Unified Communications environments, the Sennheiser D 10 USB is a mono wireless DECT headset for connecting directly to the softphone/PC. Designed for all-day use, its streamlined design makes no compromises when it comes to exceptional sound and brings the freedom of a wireless solution within reach of even more everyday users. With plug and play UC compatibility, the D 10 USB has a streamlined design featuring built-in cable management, magnetic charge interface for secure placement and status indicators to show available talk time. 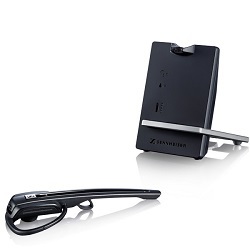 Its lightweight headset offers 2-in-1 wearing styles with headband or ear hook. The D 10 USB has a built-in ringer and is UC optimized for maximum productivity with leading UC platforms. With a range of up to 55 m (180 ft) in a typical office environment, it provides a full workday of talk time with fast charging of up to 50% in just 20 minutes. DECT spectrum wireless connectivity does not interfere with nearby WIFI devices and gives a cleaner, more stable sound. 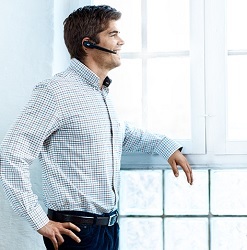 Use up to 4 headsets per conference call from the same base station and take advantage of convenient hot desking. Easy one-touch call management* for control on the go. 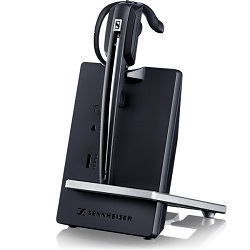 Sennheiser patented ActiveGard® technology provides hearing protection against acoustic shock.